During its brief history, from 1887 until its closing in 1900, the Hotel Monte Sano served as one of America's most opulent resorts. Anointed the "Saratoga of the South" by its proud owners, the hostelry provided a summer playground for some of the period's richest industrialists, the Goulds, the Astors, and the Vanderbilts. So when fifteen year-old Sophie Franklin arrives there with her family in the summer of 1892 she doesn't know what to expect, but it isn't a handsome stable boy named Jude and his African American friend Smokey. And a butchered body, bleeding to death under the hotel's boardwalk! Shocked and afraid, Sophie's mother wants to pack the family back to New York. So Sophie can stay and continue her budding romance with Jude, she and Jude and Smokey set out to find the murderer. What they find instead is a Gothic maze of Jim Crow bigots, Yankee carpetbaggers, pistol-packing gamblers, menacing ghosts, and revenge seekers determined to settle a Civil War grudge not so long since passed. "Part history, part mystery, Charles Farley's "The Hotel Monte Sano" reveals a glitzy side of turn-of-the-century Huntsville." --Gregg Parker, the Madison Record. 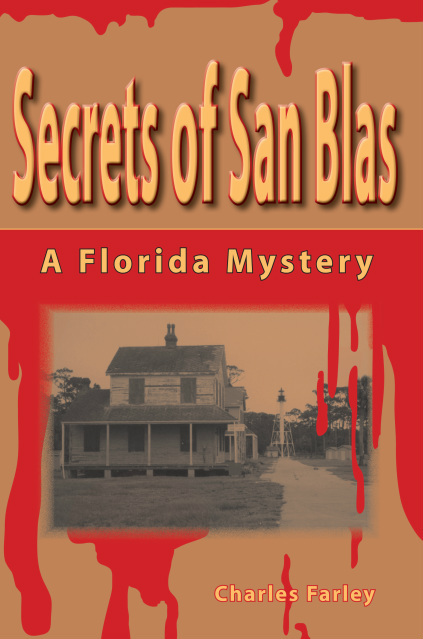 Now available...the much anticipated third and final installment of the Doc Berber "Secrets" Florida Mystery Trilogy. Things are not always as serene as they seem in the little Florida Panhandle village of Port St. Joe. ﻿ In Secrets of San Blas, old Doc Berber, Port. St. Joe's only general practitioner, was dragged into a murder investigation, a romance, and a series of intrigues that even he couldn't diagnose. In Secrets of St. Vincent, bluesman Reggie Robinson was wrongly arrested for the gruesome murder of Sheriff Byrd "Dog" Batson, forcing Doc Berber and his best friend, Gator Mica, a half-breed Seminole Indian, to mount a quixotic search for the sheriff's savage killer on equally savage St. Vincent Island. Now, in Secrets of St. Joe, old Doc Berber faces the most frightening challenge of his life, because someone in the tiny Gulf Coast village is trying to murder him and everyone he loves. When the doctor foolishly sets out to track down the revenge-crazed killer himself, he is forced to confront the most shameful secrets of the town, the murderer...and himself. "An unforgettable journey through Florida's Forgotten Coast...a delightful dance of history and mystery, and intriguing interplay of fact and fiction. Schedule some time in historic north Florida with Old Doc Berber first chance you get." --Michael Lister, author of The Big Goodbye. "I love a good mystery. Who doesn't? And Poirot has nothing on the three mysteries I just read by Charles Farley. The characters are believable; the stories are tight and the writer is a professional. The so far trilogy, and I hope there are many more in the series, are the best I've read in years. The Secrets of San Blas, the Secrets of St. Vincent, and the Secrets of St. Joe take place in the armpit of Florida, that area of the Florida panhandle on the Gulf Coast that mostly lies east of Panama City.